Digital: A Love Story is great for beginners at Interactive Fiction because it follows a literature style more than an adventure story line. 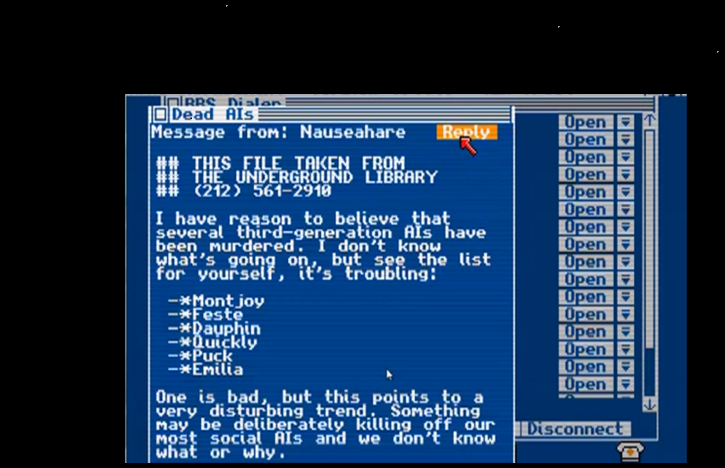 The story is played through a series of email correspondences. It starts out with you receiving your very first email account. The interactive fiction elicits your emotions and personage by asking you twice to give your real name. Through the revealing of oneself the email account becomes your own. Although it is evident early in the game (by the swapping of love poems) that you are supposed to build a relationship with Emilia there are other features of the game you have to explore in order to receive emails from Emilia. I found myself reluctantly exploring the possibilities of “young” internet. The communities are small and personal. Your friends help you navigate through the web because you are a “noob”. 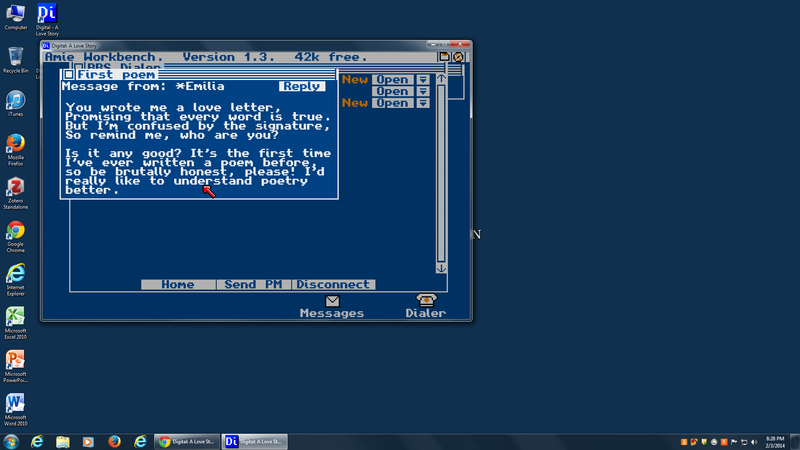 The more information I received about the founding of the internet and its initial purpose the more intrigued I became. 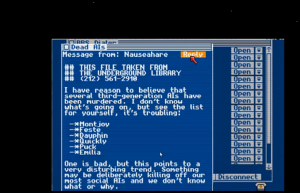 The game displays several opinions, some radical some experimental about the possible future of the internet. I enjoyed the contemplative and openly defiant remarks of my friends. All the while I was a little afraid that my borderline anarchist friends might get me in trouble with the government. In some parts of the game I was afraid I would get caught by the government because of the messages I was receiving. I was also afraid I would get a virus on my computer. At the same time I wanted badly to foster an intimate relationship with Emilia but like real relationships it takes time. At one point I did get a virus and had to reboot my computer. It was disconcerting having to follow all the same steps. What was most upsetting was Emilia and I’s relationship was erased. She had no recollection of our past relationship. I had to rebuild the level of comfortably I had gained with Emilia. I think this took away from the realness of the game that I felt initially because in reality even if the emails were gone Emilia would still remember me. Nonetheless, this game is a great modern day love story. It helps to set the viewing screen as “Full Screen”. This creates the allusion that your computer is from the early 90’s. The suspense waiting for emails from Emilia simulates how I have felt and I imagine how many people felt when dealing with a virtual world. As the game proceeded I realized it was not so much a romantic love story as much as it was a story about fostering community and protecting “people” and values. Emilia taught me both of these lessons through her sacrifice. This story left me feeling a lot of conflicting emotions because I initially thought I was in a “queer” relationship because both the protagonist and Emilia are suppose to be female. Then, I discovered I was in a totally different type of “queer” relationship. Prior to this game I would never have considered this type of relationship under the queer umbrella but this interactive fiction prompts you to reconsider ones relationships with technology and our interactions with relationships through technology. This is a genuine digital love story. Spoiler Alert on the last picture. This is a really interesting game mainly because, like you said, it seems like a mix of IF and a game. The fact that you don’t have to type what you want to do and can instead just click makes the game much less frustrating than text adventures. I really like the aesthetic here and how it fits the time period along with what everyone is talking about (in particular, that one guys fear of Japan). It made the online world feel really small and close knit like you said. What the weird part was for me, other than the whole Emilia thing, was how you had absolutely no control over what you sent to people, you could decide to send stuff or not. This was the most interesting part for me, because when I read a characters response I would have to guess what my character said in order to get a feel for them. That was a really interesting thing for this to do. One thing I think is worth pointing out is that despite being such a text heavy piece of Interactive Fiction, it still allows for complete immersion. You mention aspects like being able to make it full screen, which immerses you into the time period and appropriate technology. Among other things, the music that plays in the background is rather relaxing and peaceful, which creates an appropriate atmosphere. Another comment I would like to make is the sort of relationship you build with Emilia. I especially found myself constantly waiting for her responses to our messages. Even when they didn’t come, I would re-read her original messages. I think this says something about the emotional connection and complexities that can stem from IF. It may also say something about human beings’ need for interaction. I wonder if anyone else had the same feeling of wanting more interactivity with other characters, as I found myself almost craving someone to call or message while waiting. Therefore, despite being a piece of IF that relies more heavily on the literary aspect rather than the adventure aspect, it still manages to bring out a sort of emotional response.